Updated post Jan 2018 with new tools we have recently discovered and prefer! Troy and I hate travel planning. So why do we torture ourselves with independent travel and instead, book a package tour? Great point. We used to book package vacations, but we were missing out on the things we like most about travel – exploring off-the-beaten paths, spending more time doing things we like doing the most. 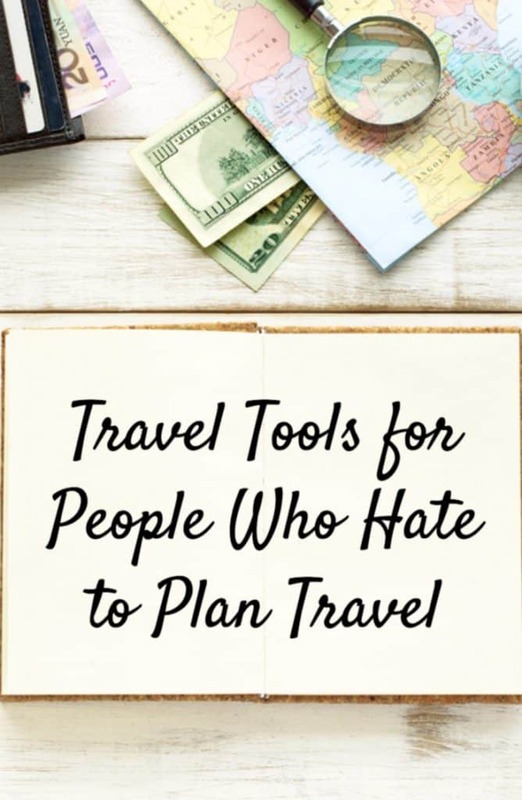 Good thing we found the right travel tools to simplify our plans and we’d love to share them with our readers. We prefer to travel at our own pace, immersing ourselves in it, having the flexibility to explore, staying longer when we love a place, or leaving early when we don’t like it. Slow travel is perfect for digital nomads because we often need to stop and work online to make money to keep traveling and living. But you don’t have to travel like this to hate planning. 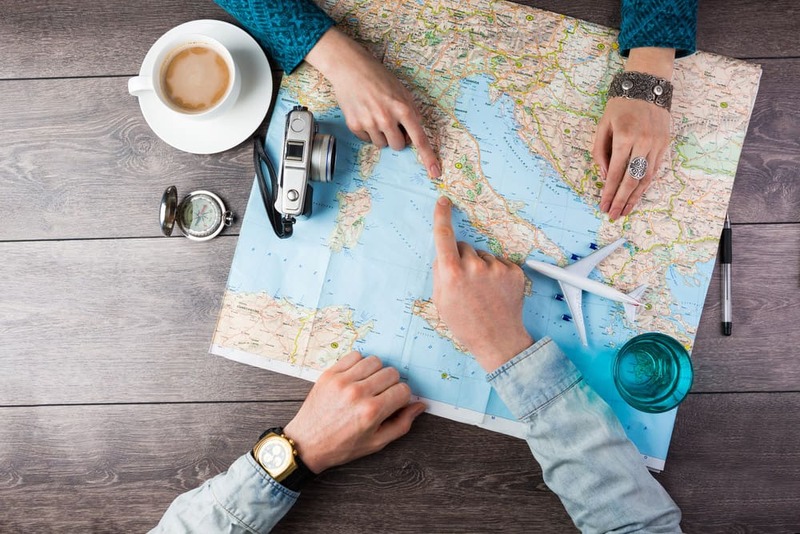 Here are a few travel tools that make travel planning easier, with built-in elements for speed, flexibility and maintaining your sanity. These travel tools and tips also help you save money depending on your inclinations. The key is putting effort into the things that you really want. For example, I am more inclined to plan with a low or medium level of effort. I will search one site, and then compare it with only one more site quickly for pricing comparison. a) Lonely Planet Guides – We grew up with these guidebooks, and they used to be our only source of information back in the 80’s and 90’s. Now, we use these more as a general reference tool to research what kind of travel we want to do (adventure, beaches, historical walks, etc.) and general information about which places to go. Over time, we rely less on these guides, as there are many sources available at present, although they are a great starting point in creating a vacation plan. b) Pinterest – Consider Pinterest as your electronic scrapbook, journal, or bulletin board to research for travel. We use Pinterest extensively to plan trips because Pinterest gives you current, first-hand information from bloggers, travel companies, and travelers of all kinds, with pictures to help you decide where you want to go. – Type in search terms for the country you are looking for, and break down the information into: (Insert country name) travel, itineraries, where to go, the Best of, What to see in (place), etc. You can still break it down further into more specific areas and options. – Add any pins that interest you onto your travel planning board and start reading and researching. OK, this could take a long time to review. But you can peruse these articles on your spare time rather than spend it watching TV. And it’s kind of fun, too, plus you also have current, visually stimulating resources. c) Google Images – I use this as a source of inspiration. For example our trip to India, a friend suggested we go to Hampi, Karnataka. I looked for Hampi on Google images and was immediately influenced to travel there. Itineraries are the backbone of travel planning. If you don’t know where you are going, and what sequence you need to take, how can you possibly book flights or accommodations? a) Search for travel blog posts for itineraries – Travel bloggers are an excellent source of first-hand travel planning information. They are eager to share their trip itineraries since they discovered travel wins and challenges first hand. Search Google and Pinterest and use the search terms like Itinerary, your trip duration, and city and town names. We traveled for four months in Colombia and created this very detailed Colombia itinerary post with options for different types of traveler, to help our readers figure out options for a 2- or 3-week vacation. b) Lonely Planet Guides – Itinerary Section – The country guide books tend to have a few pages in its early editions that show suggested itineraries. There are maps, routes and brief descriptions depending on the length of stays such as one week, two weeks, three weeks or a month. I like to use these as a guideline to map our own travel. Although I do like to look at a few other sources (like blog posts) because we go longer, and we like to find places that aren’t always the top destinations. c) Review your favorite travel company itineraries – We tend to like the trips from Intrepid Travel, as we’ve done many of their trips in the past. We like to scan their trips, view their itineraries and check the maps. These details give us an idea of where we want to go, and what approximate route we could take. Heck, if a trip looks that good, maybe you want to spare the planning altogether and book it instead. 3. Now that we have a general direction of where to go, How long will it take to get there and what transportation options are available? Have you ever started planning a trip and then realized it would take you 10 hours or more to get somewhere? Map scales vary and can make it difficult for you to get a sense of distance. Rome 2 Rio is an excellent app that helps you understand how long it will take to get somewhere, as well as options available for transport, along with estimated costs. You can find Rome 2 Rio in the app store. For example, we recently planned our travel in South India. 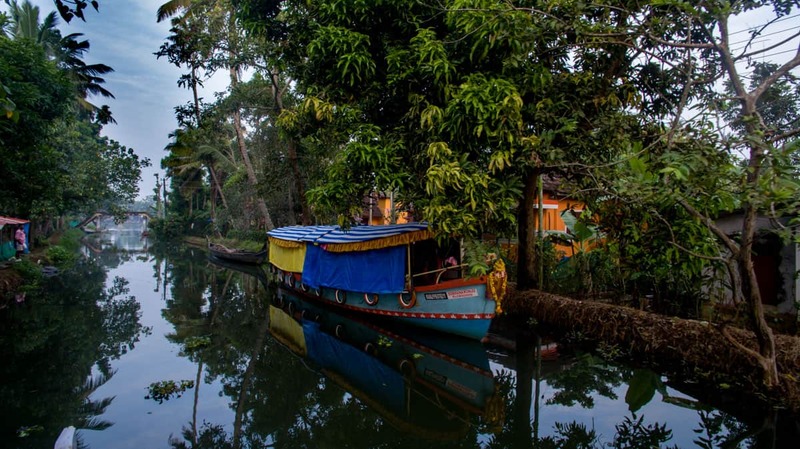 We wanted to find out how and where we could leave Palolem beach, Goa and head to Hampi in Karnataka. By filling out the departure and arrival locations, Rome 2 Rio calculates how to get there. In this case, it shows us train, bus, flying, and taxi options. The app also links you to major bus and train service schedules. We tend to use two major sites to book and make pricing comparisons for Air Travel, but if you don’t want to deal with the daunting task of comparing prices, we will vouch that the first option below can be enough to provide you with the information you need. 1) Google flights – Google flights is a simple, easy-to-use platform to search for flights. We love it because it graphically shows you on a calendar the cheapest days to travel. You can even search by region (instead of by the city, if you want to determine the best route). Google’s latest updates allow alerts for price changes and other ways to easily find the best price flight. Here is more information on how to use Google flights. 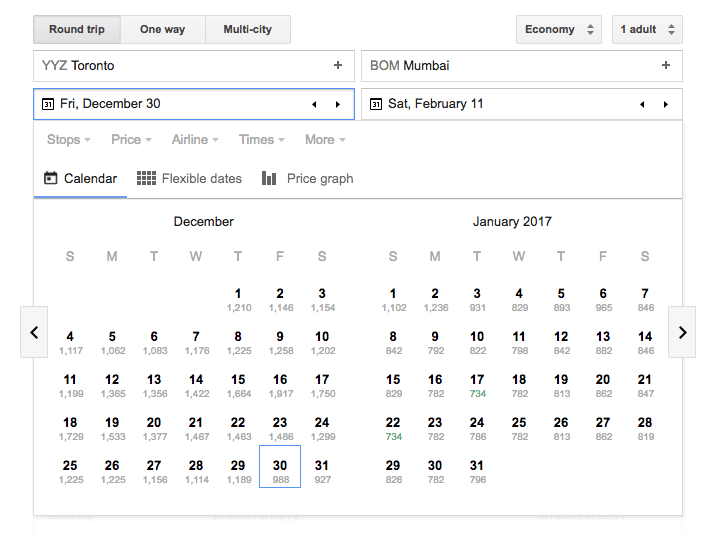 Pricing chart on Google flights that shows costs depending on the day you travel. 3) Direct – Sometimes it is cheaper to book directly with an airline, so if you noticed the airline options from the number 1) or 2) and you have the time, check the online flight price. Clear your cache. It deletes your browsing history or cookies so your computer can’t be recognized. Depending on the browser you are using, you can do this by checking the information here. Special money saving tip: There is a great website called Secretflying. This site finds killer good deals on ‘mistake’ fares. These are tickets posted by airlines in error that are significantly lower than what they should be. Of course, airlines will honor their posted rates, so this results in some impressive sales. Note we haven’t used this site yet as we haven’t found a flight that worked with our schedule, but you have to act fast, as these offers go very quickly. Setting alerts from your home airport would be a way to attempt to purchase one of these deals. 1) Rome 2 Rio again, is a helpful tool that links to a country’s bus and train service. 2) An excellent blog called The Man in Seat 61 shares everything you need to know about train travel in most places in the world (Europe, India, USA, Canada, and Africa). The blog is jam packed with info about how to book a ticket, understanding how the class system works, where to go – you name it and it may probably has it. We used this site to plan train bookings from Thailand to Laos and throughout India. There are also tips on booking Ferries. 3) Local City Apps or Google (for Bus travel). Given its specificity by country, Google is most likely your best friend on the road. Simply search ‘Bus Travel’ (insert country name) and you can find loads of references. Troy and I want the hassle-free way of booking accommodations. Meaning, we prefer to do it everything online, without calling or emailing hotels or guesthouses directly. I find it difficult to call due to time zone differences, language, and lack of cell service. We don’t have the time to manage all these sources of information, emails and details coming my way unless I really have to. HotelsCombined– Is our first stop in searching for accommodation. It’s a user-friendly platform to compares prices from hundreds of different accommodation sites to get the best price. Booking.com – Often, we end up booking from this site. The app is very simple to use and is handy when you arrive in a certain place and you need to revert to your booking information. You can search in multiple ways – by ratings, by specific features, by price and more. Note that taxes are excluded when searching, so make a note of your final price. Airbnb – We love Airbnb because it allows you to live like a local by staying in someone’s home, giving your stay a more intimate feel. You can choose private room, full house, shared room. We use Airbnb extensively all over the world. If you have never used this service before, click on this link here to get $40 CAD/$30USD off on your first stay. Warning: You can spend countless hours searching for accommodation. Use the filters on any of these sites like areas, proximity to the airport, Wi-Fi, pool, and pricing, to help you search a smaller list of options. One more site we visit is TripAdvisor. It is another way to read reviews for each stay, but it also links to other sites like Agoda to book directly. Again you can spend hours searching for accommodation. I often check my choice on Booking.com or Agoda, and then quickly verify recommendations on the Trip Advisor app to validate my choice. I have to admit that I tend to spend hours searching for the perfect place. This drives Troy crazy but when he takes control of the computer, booking is done within minutes. We use TripAdvisor and travel blogs extensively to search for places to eat. What’s the best way to save time? Enable the GPS on your phone. This allows Trip Advisor to show restaurants and eateries near you. Important note about TripAdvisor: We prefer to read comments versus solely relying on the rankings on TripAdvisor since one review can easily sway a rating from 1st to 5th. Just because a place is rated #10 doesn’t mean it’s not a great restaurant! Comments are critical. 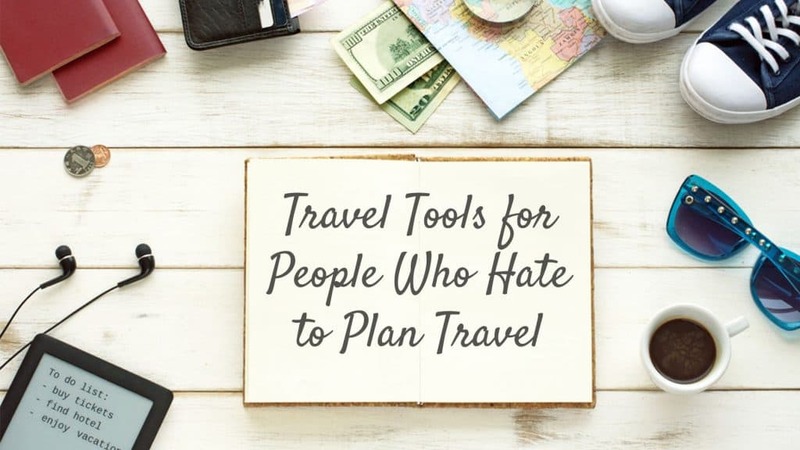 Have we missed any travel tools you use to book travel? Do you use any other time-saving ways to plan? Please let us know. By using some of the links on this page (at no extra cost to you) it will generate a small commission from any sales. We recommend these products because we love them and use them regularly. This helps us keep providing quality content and tips for you. Enjoy your new products!